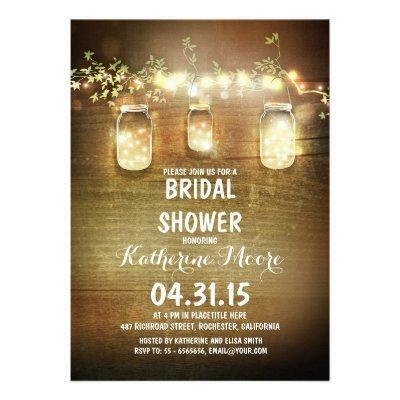 Rustic mason jars bridal shower invite for summer, fall, spring or winter wedding! Perfect design for vintage country bridal shower with mason jars and strings of lights. Design consists from distressed old barn wood background, shimmering night lights and hanging lights mason jars. Please contact me if you need help with invitation customization or have a custom wood color request. -----------If you push CUSTOMIZE IT button you will be able to change the font style, color, size, move it etc. it will give you more options!